In the spirit of both honesty and self-improvement, I’ve got a little something today not only for homesteaders, but for those of you who lean more towards prepping as well. Now, let’s first get this out of the way. Prepping means different things to different folks. For some, traditional homesteading is prepping. Learning skills like baking bread from scratch, canning, gardening, or how to butcher a chicken or a pig prepares you for self-reliance and sets you on the road to self-sufficiency. For others, prepping also delves into BOBs, BIBs, MREs and stocks of water, gasoline, and ammo. I’ve often heard it said that not all preppers are homesteaders, but all homesteaders are preppers. And yet, I’ve met a few homesteaders who do not store water, gasoline, or ammo, and have no idea what a BOB or a BIB is. So clearly, people define prepping in different ways. If your aim is self reliance and self sufficiency—whether that’s in order to run a farm or run for the hills—you need to be healthy. I will let that sink in for a bit. Some of you are saying, yeah, duh. Some of you are saying that’s the entire reason I started homesteading/prepping: because I wanted to get healthy. But let’s be honest: some people spend way more time talking about it than actually doing it. Some of us know people like this. Some of us are people like this. And believe me, I get it. It’s much easier—and a lot more fun—to talk about living off the land than it is to actually live off the land. It takes far more time and way more effort than what most people realize when they’re just talking about it. I’m all about being super honest, right? I am not above occasionally stopping at Starbucks if I happen to be in town and grabbing a treat. I don’t always choose the old fashioned, simple way and I don’t make every single thing that we eat from scratch. But friends, you cannot run a farm or run from zombies if you’re eating more junk, processed food than not. You cannot run a farm or run from zombies if you lounge on a couch or sit at a desk for the majority of your awake hours. You need to move your body. Or in other words, you need to walk the walk instead of just talking the big talk. 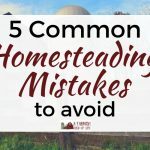 There is nothing more obnoxious than a homesteader or a prepper telling you how to take care of physically taxing issues on your homestead or how to deal with the zombies when they can’t even climb a flight of stairs without getting winded. There is nothing more ridiculous than a homesteader or a prepper thinking that when the time comes they will, by virtue of being a Homesteader or a Prepper, be automatically ready to handle what’s thrown at them. Tell me again how you’re going to spend all day hunting for your food when you don’t even have a clue where the rabbits, deer, and turkey are right now? Live right now like you’re going to live when things get hard or challenging or tough. In other words, jump into it right now so you have to deal with things that are hard and problem solve the challenges. I say that because we have learned so much in our 8 years here on the farm. It blows my mind that there are people out there who think if times get tough, they will just automatically know how to do things on their property. Or that secret property they’re going to run off to. Or that they’re going to be able to handle a exponential increase in physical activity when right now they can barely lift a bag of cat litter. Or that they’re somehow going to be able to deal with the elements when right now their exposure to any elements is only from the house to the car and the car to work. Some of us believe we are in much better shape than we are. Some of us have forgotten we’re not 20 anymore, but we’re still planning to lift and run and fight and do like we’re still barely out of school. You guys, this is not a movie. This is not a dystopian novel. We’re talking about real life and you need to stop and consider if you are really fit enough to survive what you say you’re planning for. Are you in shape enough and tough enough to do the things you need to do when the time comes, whether that’s spending three hours fixing fence in rain and 30 mph winds, cutting and hauling wood though deep snow, sandbagging or bailing water after a destructive storm, or heading to the hills to escape civil unrest? When I say healthy, I’m not insinuating that you need ripped abs. This does not mean you need to be a size zero. In a SHTF survival situation, a stick thin gal probably won’t last very long—but neither will a prepper who can’t get out of his chair because he weighs 543 pounds. Move your body. Maybe don’t drive the Ranger from the woodshed to the outdoor wood boiler. Maybe instead, pull a cart or sled filled with wood. Maybe don’t have your kids unload all the bags of feed from the back of the truck. Maybe go out and do it with them. Not because they can’t do it themselves, but because you still need to be able to do it 15 years from now. As you age, you generally find it is harder to get your strength, flexibility, and stamina back. In fact, the older you get, the harder you have to work for things that used to come naturally when you were younger. Yes, your brain may get wiser as you get older, but your body recovers a lot more slowly from all the things you throw at it. Use it or lose it. Seriously. I am not for a moment advocating you never eat anything but kale and duck eggs. In fact, I tend to believe those with the most restrictive diets will have the hardest times in a survival situation—whether that’s a weather related disaster, loss of income, or TEOTWAWKI. But we are all adults here. I think all of us know that a piece of carrot pie or a glass of strawberry rhubarb slush as a treat is a completely different thing than having pie and rhubarb slush serve as the basis of your entire diet. While I’ve tried a few different eating plans in my life, the one I always come back to is simply eating like a homesteader. In other words, eat what you’re growing. Eat what you’re raising. Eat what you’re making from scratch. Make that the honest basis for your diet and I’m not sure how you can go wrong. Good food takes time, and so it’s always a good idea to plan your weekly menu. If you don’t prepare to eat the super good food, you’ll end up eating the super convenient food which generally has little to no benefit to your body. Janet from Timber Creek Farmer reminds us, “Eating healthy is the number one way to be a successful homesteader. You will need to fuel your body properly to tackle the jobs ahead.” Her article Eating Healthy Food for Homesteading Success is a great reminder that the life of a homesteader (or prepper) requires stamina, long hours, and strength. How will you handle that if you’re not giving your body good fuel? The same internet that birthed the keyboard warrior is the same internet that has birthed the keyboard homesteader/prepper. In much the same way that a keyboard warrior feels more brave in their arguments from behind the safety of a screen, it’s easy for a keyboard homesteader/prepper to feel invincible. As if somehow by talking about what we imagine ourselves being able to do means that we will be able to do it when we’re called to. I’m all about following your dreams and believing in yourself, but I also know that thinking about growing all of your animal feed is a lot different than actually growing all of your animal feed. And sitting on your duff researching how to do it for a survival situation is nothing like actually doing it. Folks, you can’t effectively prepare for a natural disaster or major civil unrest when you can’t even climb a flight of stairs. And you can’t grow all your own food with a packet of seeds that you aren’t even sure will grow in your zone because you’ve never stuck anything like them in the ground. Work on the things now that you’re planning for later—don’t just talk about them. Be realistic. Be healthy.